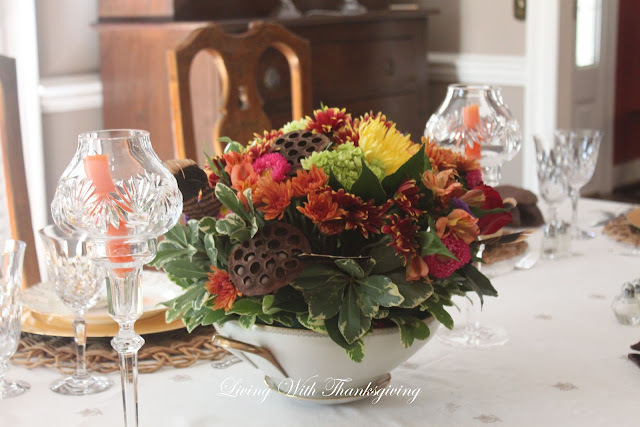 It's time to think about decorating for Thanksgiving soon. 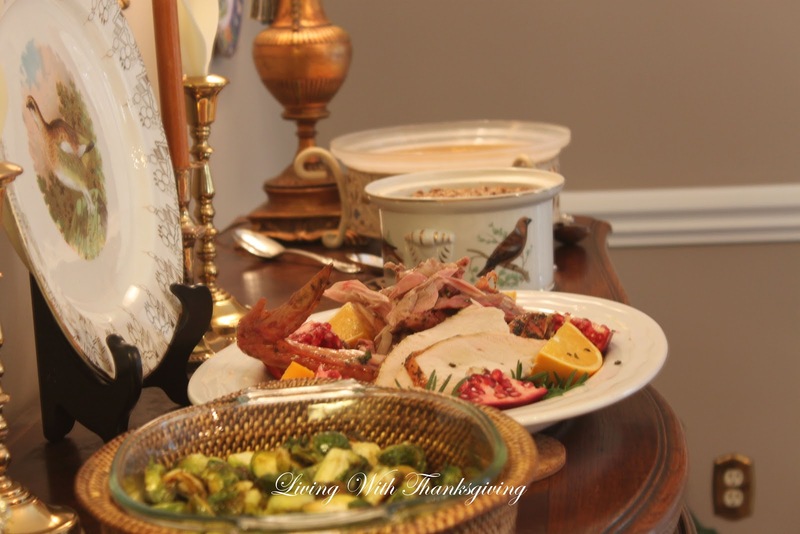 I am sharing our 2014 Thanksgiving Day with you today since I didn't post it last year. 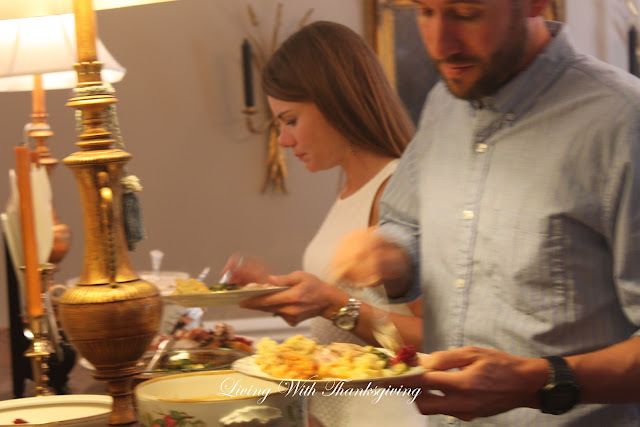 At our house we usually use the same dishes and have a similar menu each year. Makes it a little easier especially cooking the same favorites. The last two years I've served buffet style in the dining room. I changed a few things from the previous year which you can see here. I put the serving dishes in place ahead of time to make sure I have everything. I don't know about you but I have to do as much ahead as I can. I want to enjoy my children and grandchildren so I set the table early. This year I decided to use a tablecloth instead of place mats. I had a grand time ironing it too! I actually talked on the portable phone to a friend the entire time it took to iron it which made the job much easier. I set the ironing board at the end of the table as I ironed so I could easily slide the cloth onto the table to avoid transporting and creating more wrinkles. Pic is before ironing. I also start thinking about flowers ahead and scout out what is available but don't buy them until the day before so they will be fresh. The sunflowers never opened properly so I had to fill in with dried pods and feathers and greenery from my yard. I like the texture they added. The container I used was a china serving dish. 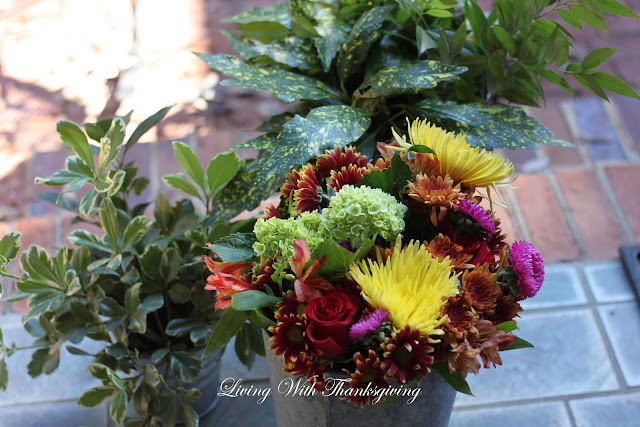 It is amazing what you can do with a $12.99 bunch of flowers from the grocery store by adding things from your house and yard making it look like a $60.00 floral arrangement. For more needed greenery I added pittosporum from my yard . When you have a round arrangement it takes more flowers so I also added turkey feathers and seed pods to fill in. Looking at this pic I could have added wheat that I had also. I washed all the greenery not wanting to bring bugs in the house. It is good to soak your oasis in water the day before arranging so it is soaked through and through. 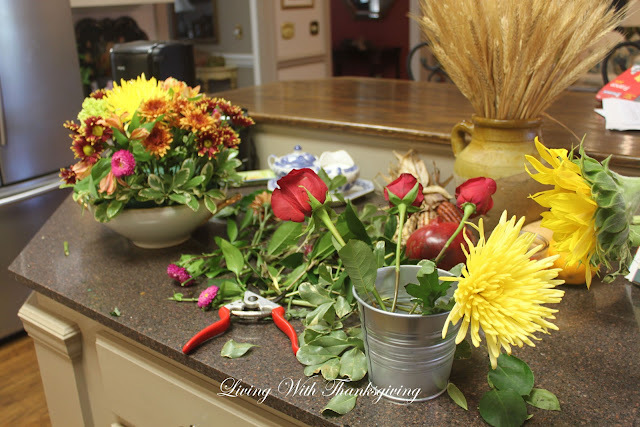 You can see the preparation and steps for making an arrangement using an oasis here. Oops my candle is crooked! 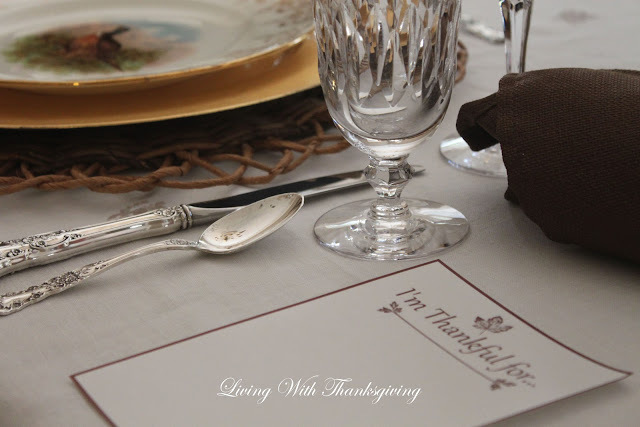 I am so sorry I can't remember the blogger source of the pretty, "I'm thankful for," free printable. It added so much to our table.We have so many blessings we could fill the page. I couldn't do without my daughter helping in the kitchen. 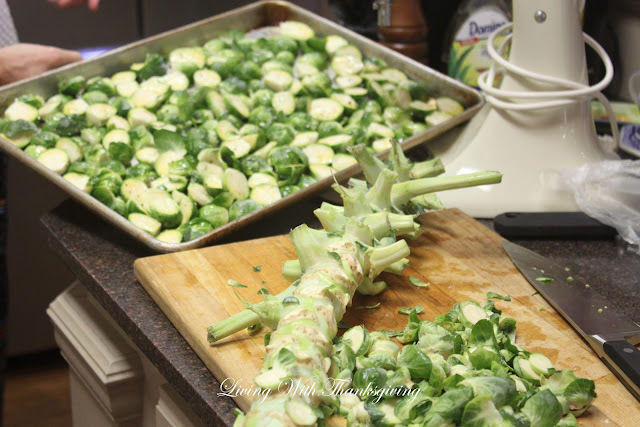 I love fresh Brussels sprouts fresh from the stem. We all noticed a difference in their taste. I only see them available to buy in the stores around the holidays. 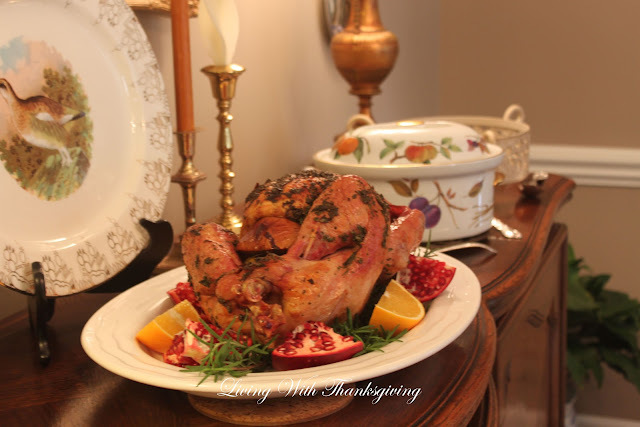 Viola, turkey is ready after Green Egg magic by my SIL and husband. 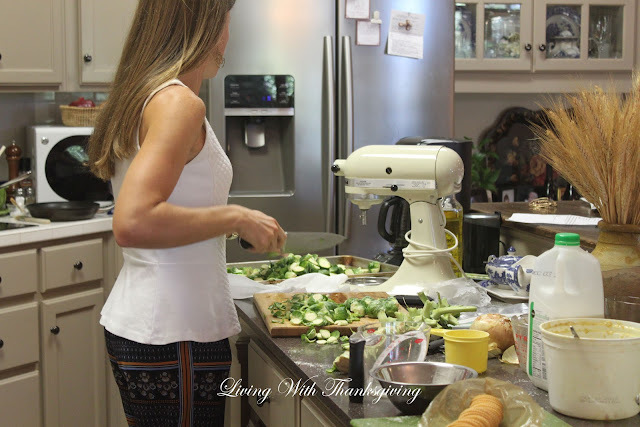 Menu: Roasted Brussels sprouts, Roasted Turkey, Cornbread dressing, Squash casserole, Sweet potato casserole, Homemade Cranberry sauce, Pecan and Pumpkin pies. Previous Thanksgiving posts here and here. We were blessed to have my MIL and daughter's family together. It is sad to look at this picture a year later. We aren't sure if my MIL will be able to join us this year. I also wish my son and his family could be with us but they live too far away. 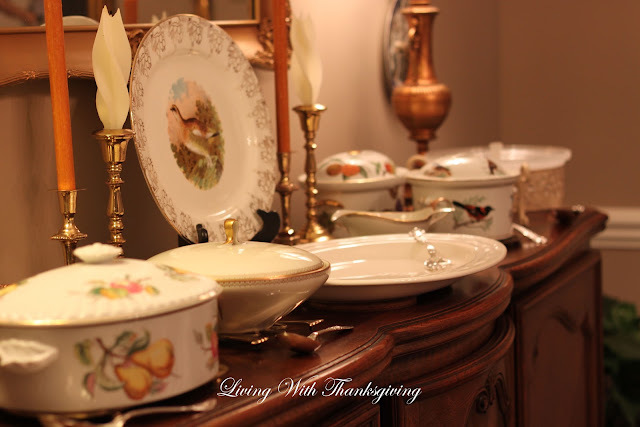 I began blogging at Thanksgiving in 2009, hence the name, Living With Thanksgiving. My daughter came up with the name and I knew it was a perfect fit for me because I truly desire to live each day with a thankful heart. My first post was our family Thanksgiving tablescape linked here. I just viewed this first post and am chuckling because there were only five little pics and no commentary, however, I remember how hard it was at the time. I could get choked up thinking about all my readers over the years that took time to comment. Aren't comments encouraging? Learning blogging techniques, photography and sharing common interests with other bloggers have been rewarding experiences. 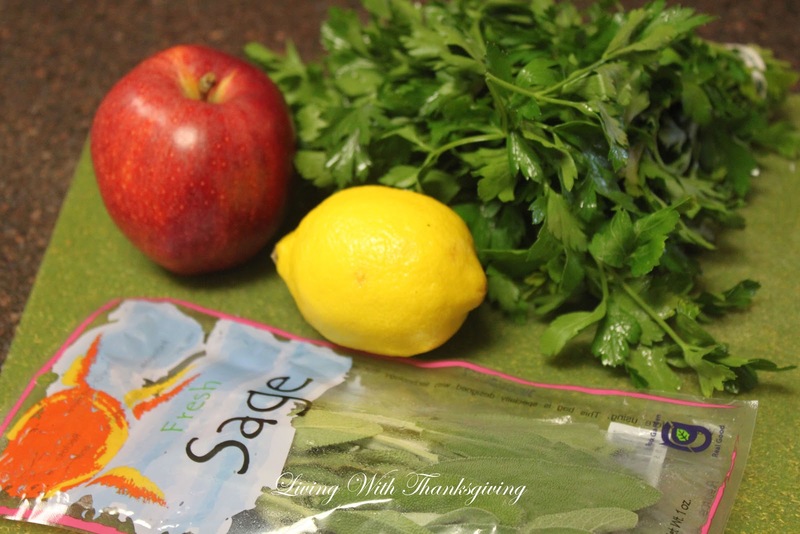 I am thankful for the friendships and inspiration from other bloggers. I haven't posted very much this last year but I'm still here and will blog when I can. 1. You, my readers that encourage and inspire me. 2. A forum to exchange ideas and common interests. 3. An outlet to express creativity. 6. 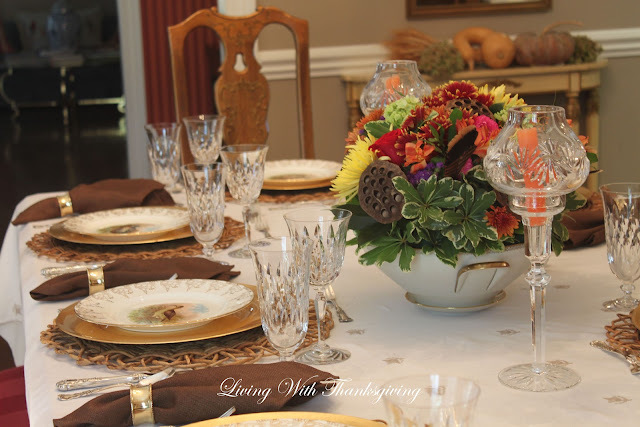 The Thanksgiving season when we can reflect on all the bountiful blessings GOD has provided for us. I am thankful for our country and the freedoms we enjoy. May we always be grateful and thankful people. 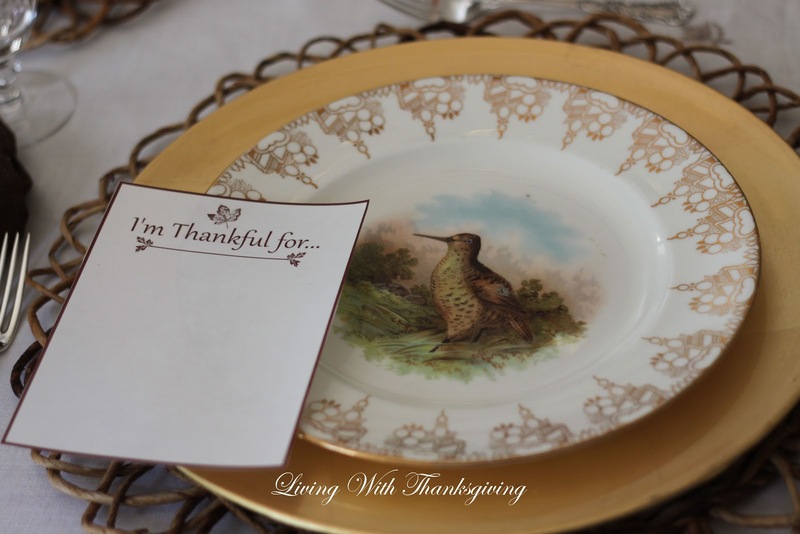 Linking to:Coastal Charm, AStroll Thru Life,Wow Us Wednesday,TablescapeThursday,Share Your Style Party, Foodie Friday, Thoughts From Alice. What a wonderful post, Bonnie. I wondered where you came up with the name...now I know. 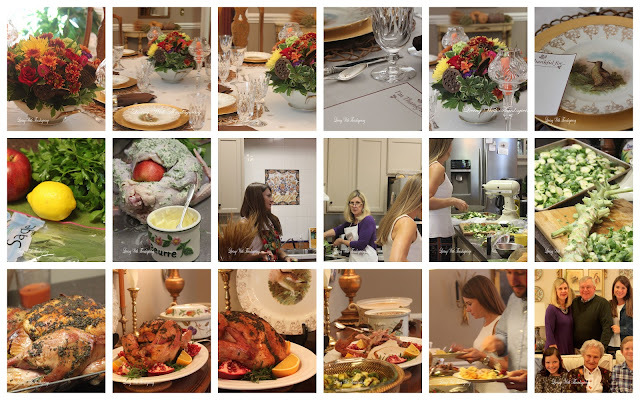 Your last year's Thanksgiving looks just wonderful...full of family and love and good food. I am sorry about your MIL and hope she might be well enough to spend part of the day with you. This will be our first year without our youngest daughter and her family here. They, too, live too far away to make the drive. Oh, Bonnie you spread a beautiful table. 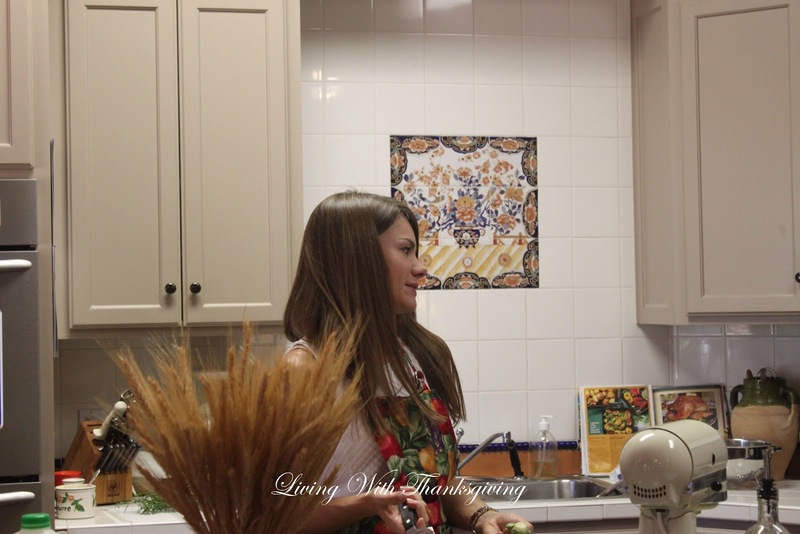 I love the scene of the kids helping in the kitchen. I've always had a kitchen too small for more than one. 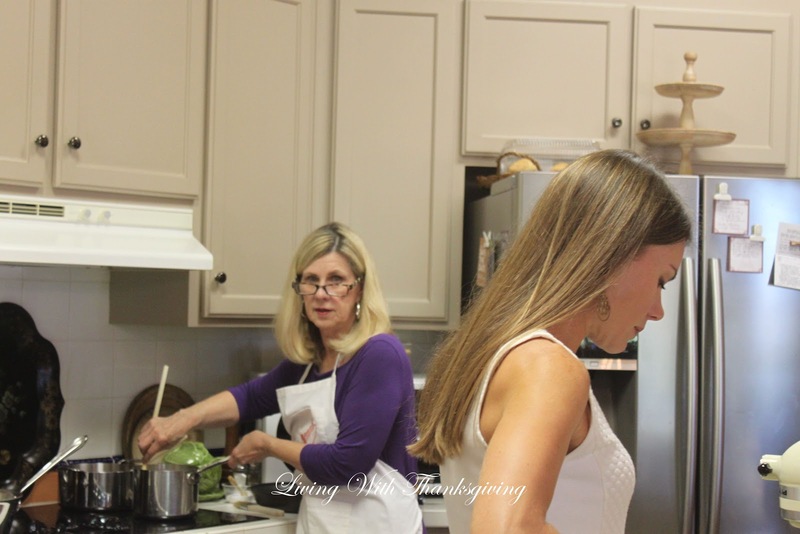 Mama's kitchen was always full, watching her cook and helping her stir and cut veggies and pour in ingredients. Lovely. I understand how things change and have missed my family being together since my parents died. I'm so happy to be near my children. For that and so much more. I am thankful. Oh dear Bonnie, you had a wonderful Thanksgiving last year. The family togetherness it's the best and your table is gorgeous and so is the food. I've never seen Brussels-sprouts in a stem. Maybe I should look for this, I'm sure they have them here in the open market. I hope you will be having your dear Mil and children this year as well. Your DD is a sweet girl to help you along. We'll be only with one DD Sofia this Christmas and Thanksgiving I will be in Miami with our DD Alexandra who is about to give birth by the10-15 of this month, in just a few days. She's having a girl and we are so excited! Thank you for sharing Bonnie. Happy November. 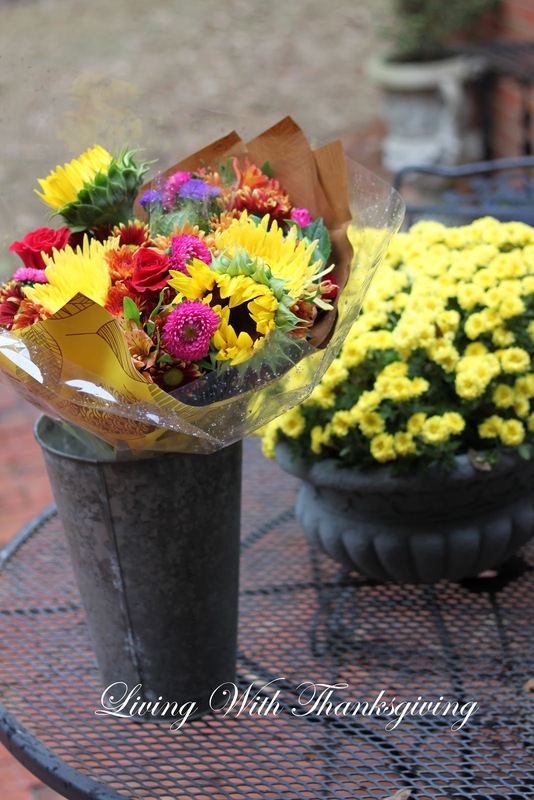 Your table and arrangements are beautiful. And your family too! What a good-looking family, Bonnie!! I really love this post, and I'm so glad to learn where the name of your blog came from. Your daughter came up with the perfect title for your blog. I can tell you're one who is thankful for her blessings in life. As usual, your table is gorgeous; those dishes are to die for. I've already looked at your post on flower arranging with floral foam. :) I need all the help I can get in that department. ;) Your food looks delicious Bonnie; I'm sure everyone cleaned their plates! 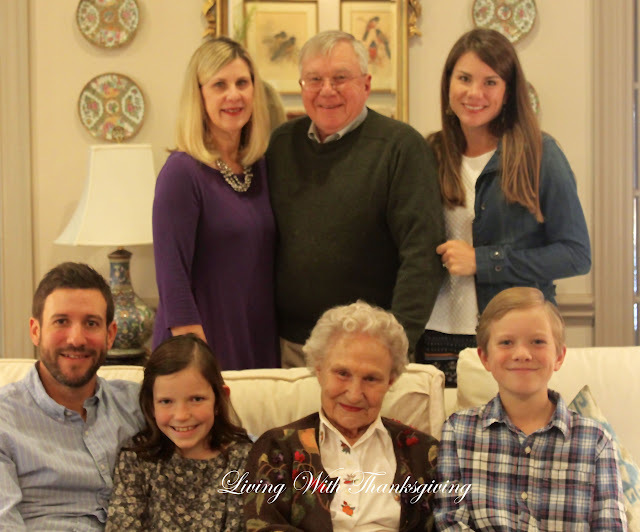 I'm looking forward to Thanksgiving this year; we have much to be thankful for here. Take care ,my friend, and have a great week! I never knew that was the reason for your blog name. That makes perfect sense now! 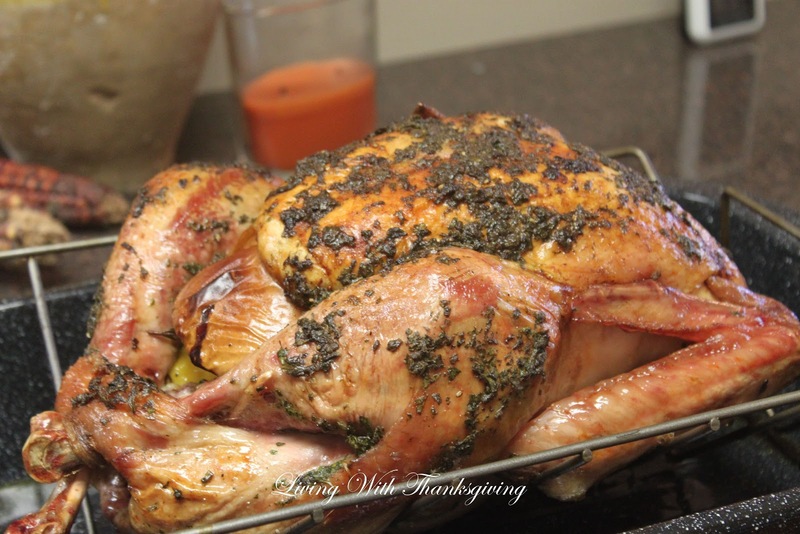 Your Thanksgiving dinner looks so good from last year. I kind of wish I didn't have such a large crowd every year. Whenever one of us hosts Thanksgiving with our family, it gets bigger each year. So that means setting up card tables etc to fit everyone in. My kitchen doesn't always handle that much cooking very easily. I'm always envious of those that can sit everyone around one dining table and it's not so much work! What a lovely celebration, Bonnie. The table is beautiful and we can tell that everyone had a great time. Omigosh, you are so far ahead of me when it comes to thinking about Thanksgiving. I'm totally into trying to resettle in Houston and fretting over my yard! Your efforts are admirable, and I like the centerpiece you created. 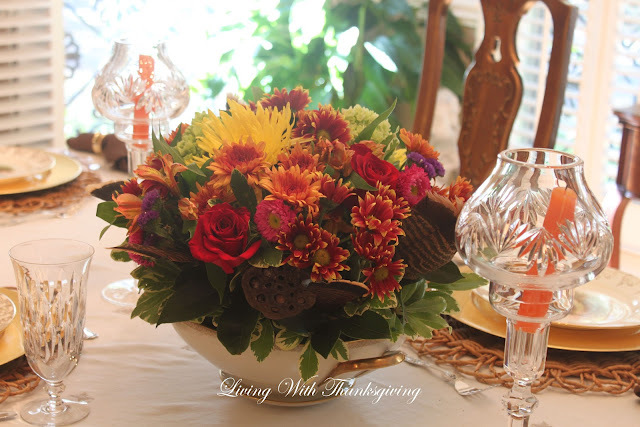 I can imagine what a blessed day Thanksgiving is for you and your family. Bonnie, Everything is just impeccable; love the centerpiece you created. You're giving me the courage to try one on my own. Love the fact that you've included photos of your family enjoying all of your hard work! So much inspiration here Bonnie! I adore the sandpiper plates and what a stunning bouquet. 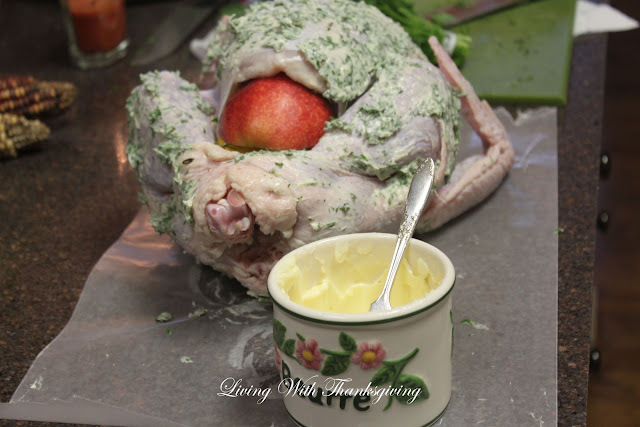 I have never seen an apple stuffed into the cavity of a turkey. Lemons,but not an apple. Must try! Sweet Bonnie, what a precious and beautiful post! Indeed, there is much inspiration here :) Your flowers are truly stunning and your table looks simply lovely! And your meal....oh my, what wonderful goodness! You have a beautiful family, my friend. Hugs and blessings to you! Excellent Post !! thanksgiving for blog it's wonderful day. Thanksgiving flowers is fabulous.